This is a quick informal video post, because it’s informal Friday, all about how freakishly awesome you are. [tweet this and/or this] I've been meaning to tell you this for some time in a video but I just couldn’t find the words. Okay that’s not true I could find the words, but I couldn’t find the time. I decided to film this video outside today because it was so lovely. And because I haven’t left my room in quite sometime. Okay well, I’ve gone to the kitchen for my food and to the bathroom but my computer's in there so I just kind of hunker down most of the time and never see the light of day. Unlike the opening sequence of this video, I don't actually keep my eyes on my subscriber numbers because I’m too busy keeping them on research and writing, and Ooby, of course. I mean, who could take her eyes off her face!? 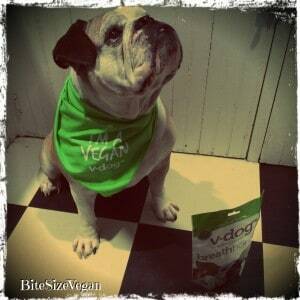 Especially when she’s wearing her new vegan dog bandana? It says, “I'm a vegan!” V-Dog sent this for her birthday. Anyways, this is supposed to be your video post. Ooby hijacks everything. I just want you to know that I am so very grateful for you. you guys are what makes this channel possible. I know that i said this to you guys a couple times, but you can never say it too many times–I really value each and everyone of you for watching, for sharing my videos and for taking the time to comment on them. Please know that I do read the comments and I do my very best to reply to all of them but I know that I’m falling far short of that at this point. But I do want you to know that if I don’t get to your comment or message on any platform, it’s not because I don’t care what you said or that I think I’m more important than you, or anything like that. It’s simply a lack of time on my part. And honestly, with the different social media platforms sometimes things do get lost in the mix. So if you ever do send me something that’s really important and needs my attention and you don’t get a reply, do feel free to e-mail me. Just know that I do get a lot of e-mails as well every day so it may be a little bit before I can respond, but I do respond every single one. The easiest way to e-mail me is to use the contact at the bottom of this website or here. 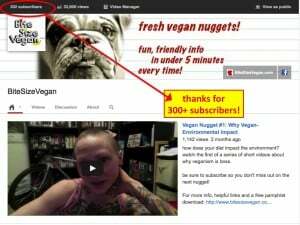 You have made this channel what it is and I am so proud that it is a place where people who are curious about veganism and wanting to learn more about their impact on the world and the animals, can come and not be attacked but rather given helpful information for their journey. I am also honored to apparently be seen as someone that other vegans can look to learn how to express themselves. As many of you know from some of my more candid, personal videos, learning how to speak about being vegan and speak out for the animals was one of the most difficult things for me throughout my life. So hearing that what I am doing is helping other people do that is rather mind-blowing. You guys keep me going. Your support means everything to me. And I want you to know that if you can’t support me through my Patreon page or one-time donations or anything monetary, that does not mean that you are not a huge supporter of my work. So please know that you guys make a huge difference, even if you think that what you’re doing isn’t huge. As a community we can create change. And a further note, for quite sometime, I was someone who couldn’t do anything more active then educate myself, read books, and hope that one day I would find the words to speak for the animals. So if that’s where you’re at right now, value that. You are an activist in the making. You don’t have to follow my path. Or anyone else’s path. You will find your way to speak for the animals. Alright. I’m to really going wrap this up. This is what happens when U’m unscripted. But i just really wanted to make this video post and let you guys know what you mean to me. I am going to do my best to keep living up to the image that you seem to have of me. And please know that I am doing my best to be available and to answer questions, but that even working on this from wake to sleep–when I do sleep–I am still always behind. But that does not mean that you are not important or valued. So, I would love to hear from you on this. Always feel free to let me know if there something in particular you would like to see me cover. I have a huge list of video topics and I do take all suggestions and put them in there if they’re not already there. I was also thinking about maybe doing another Q&A video soon. If you’re into that let me know! This is great news but also it means there are thousands of people either vegan or thinking of being vegan. People coming together for a common cause is wonderful. We can make changes and improve the lives of animals. The best is you are showing people their pets can be vegan too. Ooby is healthy and beautiful. If I ever get back on my feet financially I will rescue a few pets and feed them vegan. well thank you :) and you are right- the subscriber numbers are exciting because they represent interest in the vegan message- at least that is what excites me about them :) and Ooby is quite the ambassador for vegan doggies and companion animals everywhere!